With the autonomous radiation monitoring probe GammaTRACER, the gamma radiation dose is continually registered in the chosen time sequence. Energy-saving chip technology allows maintenance-free non-stop operation of the GammaTRACER probe for typically five years and, with an extended battery pack, up to ten years! An integrated solar panel allows an unlimited autonomy in 10 min measurement cycle (according to environmental conditions). Hermetically sealed, this radiation monitor is designed to endure the harshest environments. 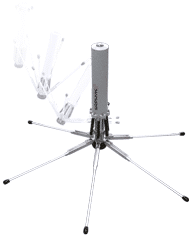 Equipped with a radio module, the probes can be used with SkyLINK and ShortLINK data transmission systems to offer a new dimension in wireless data collection. The GammaTRACER is available in five different types (BASIC, WIDE, HIGH, XL2-2 and XL2-3) that cover a broad range of radiation monitoring applications and ideally suit both mobile and stationary tasks. GammaTRACER is an autonomous and hermetically sealed gamma dose rate probe for stationary and mobile use with up to 10 years of battery life. Autonomy can be unlimited with the use of the internal solar panel (in 10 min measurement cycle). UHF, GSM/2G/3G/4G/LTE, radio or satellite modules as well as GPS can be integrated. It is designed for continuously measuring (with adjustable cycle times), recording and optionally transmitting the environmental gamma dose rate to a base station. The probe is suitable for routine as well as for emergency application, provides high sensitivity and accuracy and is compatible with further sensors (solar, rain, wind, and so on). All GammaTRACER types dispose of a built-in quality assurance system (QA) and operate within a temperature range of up to -40°C to +60°C (-40°F to 140°F). More than 4,000 probes are in use worldwide. The hermetically sealed probe, including the GM detectors and all electronic components, operates fully autonomously and is independent of any physical connections, thus resisting extreme climatic and environmental conditions. Energy-saving chip technology allows maintenance-free non-stop operation of the GammaTRACER probe. The time resolved measurement values are stored together with the auxiliary and QA parameters. Data download and parameterization can be performed via an interactive infrared or cable port. DataEXPERT, a professional user-friendly database, communication and analyzing software guarantees both simple and safe access to the stored data as well as their powerful visualization and fast, precise analysis. Additional interface possibilities for online and real-time data transmission, ranging from wired modules to sophisticated wireless transmitters, meet a wide variety of user needs.